Tactical jetfighters Sukhoi Su-27/30 Flanker and MiG-29 Fulcrum and Mi-17 combat transport helicopters are among the best-selling items in the aviation segment of Russia’s arms exports. Combat aircraft took a 40-percent share in overall Russian arms exports in 2012, keeping a trend that has become prominent in the past few years, a senior defence official said. “The structure of [Russian arms] exports remains the same,” Alexander Fomin, head of the Russian the Federal Service for Military-Technical Cooperation (FSMTC) said in an interview with Ekho Moskvy radio on Monday. “In 2012, equipment for air forces of foreign countries lead the export list with a 40-percent share, followed by weaponry for ground forces with about 28 percent, air defense equipment with 16 percent, naval equipment with 13 percent, leaving about 3 percent for other items,” Fomin said. 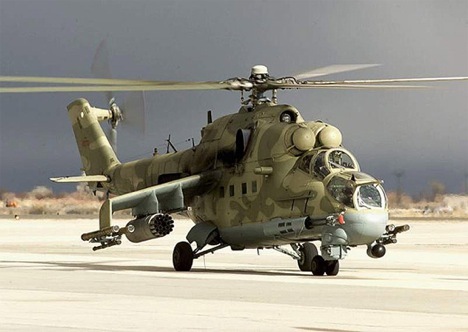 Tactical jetfighters Sukhoi Su-27/30 Flanker and Mikoyan MiG-29 Fulcrum, Mil Mi-24/35 gunships, Mi-17 combat transport helicopters and Kamov Ka-28/31 naval helicopters are among the best-selling items in the aviation segment of Russia’s arms exports. These are widely considered world-class will be ordered over the next five to ten years, according to estimates by the Russian defense industry analysts. Russia, which last year sold $15.2 billion worth of weaponry, is the world’s No. 2 arms exporter, behind the United States. Russia’s state arms exporter Rosoboronexport said last week that its order portfolio stood at $34 billion as of June 1. Russia currently supplies arms and military equipment to 66 countries, and has concluded agreements on military and technical cooperation with 85 countries, the company said. Russia’s main arms customers are India, Algeria, China, Venezuela, Malaysia and Syria. Vietnam also emerged as a significant purchaser in 2010, when it signed a deal to buy submarines, aircraft and other military hardware. Russia has of late lost some important defence deals in India, its biggest customer. Experts believe that the reasons for Russia’s setbacks in Indian tenders are both political and technical. The demands of the Indian military are growing, both in terms of technical sophistication and the scale of technology transfers, and Russia is finding it increasingly difficult to meet those demands. Selecting arms suppliers also involves the pragmatic principle of “not putting all your eggs in one basket,” Andrei Fomin, editor-in-chief of the trade journal Vzlyot, told Gazeta.ru last month. “This is totally understandable and by no means a disaster, particularly given the scope of cooperation between Russia and India on a number of different programmes,” he said.